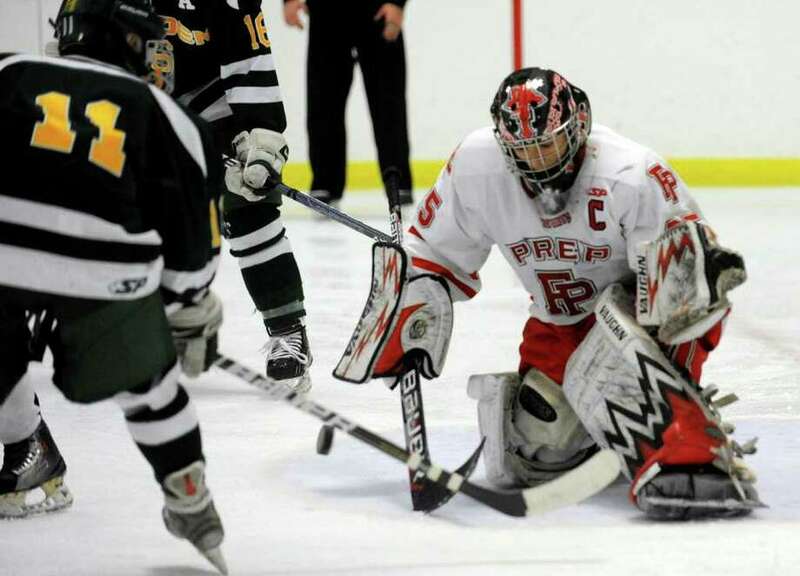 Fairfield Prep goalie John Galiani goes to blocks a Hamden advance, during boys hockey action at the Wonderland of Ice in Bridgeport, Conn. on Tuesday February 08, 2011. Prep beat Hamden 4-2. It took one period for Fairfield Prep to shake off the cobwebs formed during an 11-day, weather-induced layoff, but from the moment the puck dropped to start the second period, the Jesuits made it clear that they were back in business. Second-ranked Prep scored four second-period goals and had a fifth waved off to surge past two-time defending state champion Hamden 4-2 Tuesday night at the Wonderland of Ice. After a scoreless first period that featured a lot of pace, but not much grace, the Jesuits spotted the Green Dragons a 1-0 lead just 1:10 into the second period on a slap shot from just inside the blue line by Michael Lee. Hamden helped the Jesuits get back on track by taking a handful of bad penalties, the first of which, a roughing minor against Connor Walsh, led to Prep's equalizer by A.J. Unker. Unker gathered in a pass behind the goal, refused to get knocked off the puck despite the best efforts of the Hamden defense, found some open ice in front of the goal and lifted a wrist shot over the shoulder of Hamden netminder Matt Hoff with 11:19 left in the period. A power-play goal by Patrick Lynch just over a minute later put the Green Dragons back in front 2-1, but that lead was even more short-lived than their first one. Just 28 seconds later, the Dragons would cough up the puck near their blue line allowing Prep's Bryan Puffer to gratefully scoop it up, drive to the net and score an unassisted goal, tying the contest at two apiece. The relentless Jesuits would dominate the rest of the period, scoring a power play goal with 4:38 left and an even-strength goal with 1:50 remaining, both by Don Carnicky. "We were lucky enough to beat them in overtime earlier in the season despite taking like eight penalties," Hamden coach Bill Verneris said. "I told them that we are not going to be able to beat teams like Prep from the penalty box and it proved to be our nemesis tonight." referee waved off the score. "(Unker) is shifty, has excellent hands and is really tough to bounce off the puck," Sather said. "That should have been the goal of the year." Despite having a two-man advantage for a full two minutes early in the third period, the Jesuits were unable to add to their lead and called on senior goaltender John Galiani (21 saves) to make it stand up. Galiani was at his best in the first period with his team scrambling around in front of him and late in the third as Hamden frantically tried to get back in the game. "He made a couple of really good saves when we were disorganized in the first period," Sather said. "He's so unselfish and he just calms everything down. He doesn't get a lot of credit, but I think he's one of the best goalies around." Prep continued to roll on Wednesday with a 7-2 win over Seton Hall Prep of New Jersey. The Jesuits will take on town-rival Notre Dame, tomorrow at 1 p.m. at Wonderland of Ice.